I’ll start with a broad idea (not my own) that I believe is generally true: all around the world, local architectural forms have grown organically, mostly out of rural communities, in response to distinct physical environments. A few examples: throughout the floodplains of Southeast Asia, homes rise on stilts to allow the monsoon floods to pass underneath. In the Alps, steeply pitched roofs shed heavy snows. And in the arid mountains of Peru, thick adobe walls keep homes cool during the day and warm at night. In the same way, Nepal’s buildings are largely a product of the land the Nepalese inhabit: in a country of hills and mountains, with few flat and open spaces, rather than sprawling across acres of land, rural homes go vertical: cooking and livestock on the ground floor, sleeping quarters on the second floor, and grain storage in the attic. As for materials: the roads that would ordinarily connect small towns to larger cities are frequently washed out by the rains; as a result, rural villagers (around 81% of Nepal’s population lives in rural areas) often forgo modern materials like steel and reinforced concrete in favor of mud and stone, which can be collected on site. 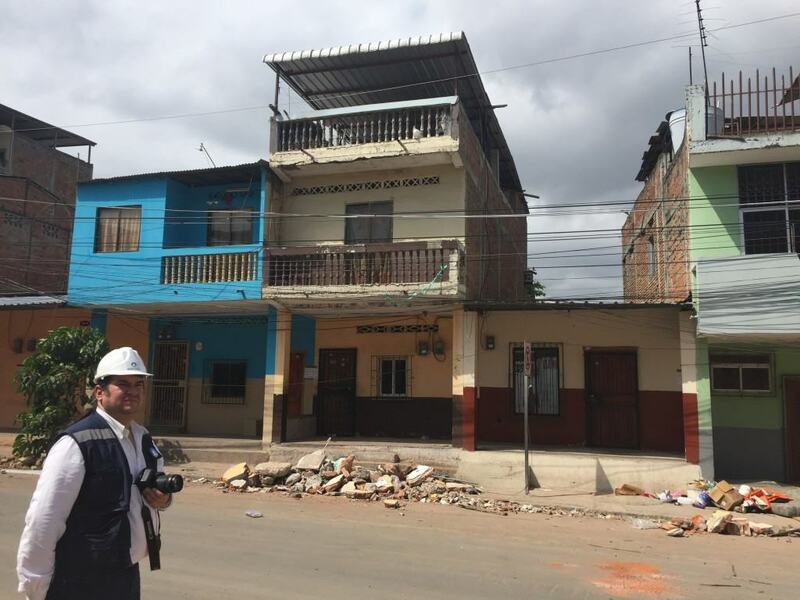 The combination of these attributes – tall homes, with heavy walls built from weak and brittle materials – creates a vulnerability to earthquakes matched hardly anywhere else in the world. In April 2015, the Mw7.8 Gorkha earthquake stuck between the two major cities in Nepal, Kathmandu and Pokhara. 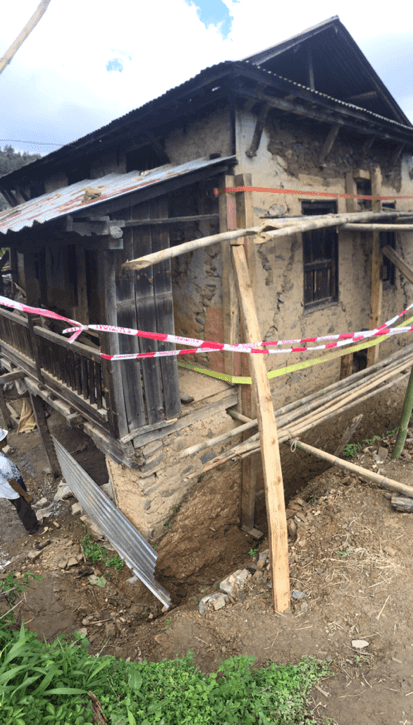 While both urban centers experienced some damage, it was really the rural communities – specifically, these homes made of mud and stone – that took the full force of the shaking. Driving through the countryside a few days ago, a year and a half after the event, the signs of damage are still very obvious, each one a dark cousin to the vulnerabilities above: collapsed walls, piles of broken earth and rock, and landslides across landscape as if it had been only a few weeks ago. 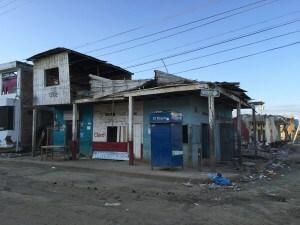 It’s not terribly surprising that the recovery has been slow – few roads exist into these villages, and accessing them even to quantify the damage has been excruciating for the government and other organizations. Of the damage and loss estimates that exist, few even bother attaching a dollar value to these self-built homes. Aside from some support immediately after the event, the longer-term recovery of these rural areas has largely faded from the consciousness of the international community. And yet, the outlook for the villages is not entirely bleak. After the event, the Nepali government promised subsidies of around USD$2,000 for any homeowner whose house was severely damaged or collapsed in the earthquake. Just this week, the first installments (around $500) were disbursed to the first round of eligible homeowners, aiding homeowners and communities to hire builders to construct new homes. Although it may sound low, relative to Nepal’s GDP per capita ($732), the housing subsidy is quite substantial (by comparison, in 1989 after the Loma Prieta earthquake, FEMA offered loans – not grants – of $30,000 to homewoners, at a time when US GDP per capita was around $22,900). 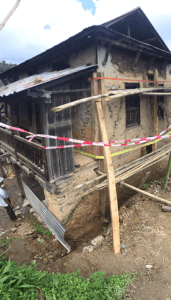 Still, the reality remains: to build a traditional mud and stone house – even without any additional earthquake-resistant features – costs $10,000 to $12,000. One in compliance with the Nepali code (the code allows unreinforced masonry homes) and the cost can rise to $15,000. At the moment, the government’s official line is that the housing subsidy is given only for new home construction. Enter Build Change’s current project in Dhunkharka, a region about four hours southeast of Kathmandu. Here, Build Change engineers are working to demonstrate the technical viability of repairing and retrofitting existing homes that were damaged (but not collapsed) in the earthquake. 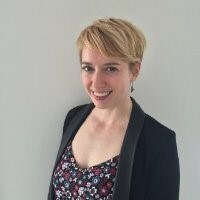 So far, the results are promising – retrofitting an existing home, even with some repairs to damaged walls, costs significantly less than building a new code-based home (around $3,000 vs. $15,000), and construction is notably faster (around three weeks vs. two months), leading homeowners to have shelter more quickly. If the retrofit project were replicated at scale, it’s likely the total cost for each home could drop entirely within the subsidized amount from the government, if the government were to view repairs and retrofits as a feasible alternative to new construction. Right now, this is a big “if”. So, fingers crossed that the thoughtful engineering and construction Build Change is doing gains traction among local and national leaders. Whether this work is enabled by the Nepalese government may mean the difference between safe housing and no housing for hundreds and thousands of rural families affected by the earthquake. I stand in the villages of Eklephant and Bhimtar, taking pictures of what was someone’s home – their intimate interiors now exposed to the elements and this foreigner’s camera lens. This building may have housed generations of families, could even have been 4 generations all at once, and their livelihoods. With the sudden and terrifying shaking of earth, what once kept them safe came crumbling down. The building’s inhabitants, both human and animal, were displaced. Some people lived out in the fields for over a week, wondering every time an aftershock rumbled through, if they would die. People set up shelters with whatever they had on hand or could salvage until the temporary shelters arrived. 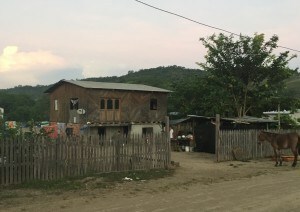 Most people are now housed in other family homes or in temporary housing – half-domed structures with of light metal roofs resembling a tunnel, and tarp, wood, or stone walls. Their livestock are right outside, their harvests drying wherever they can find space. They are waiting for government aid to come in so they can start rebuilding, some cannot afford to rebuild even with the additional aid. Here I am in their village, taking photos of their past lives and their current difficulties. I feel like even more of a foreigner than my blonde hair and blue eyes obviously indicate. I am a foreigner because I have never lost my home. I have never needed to salvage my belongings and lived in temporary shelter. I have never lost my livelihood, nor my food storage. I have never lived outdoors, fearing for my life each time the earth trembled. I have never been without clean water and sanitation. I have never worried where my next meal would come from. I have never lost a loved one under a pile of stone. Yet, here I am, an observer. I see them going on with their lives and I see the homes that they lost. I listen to them share their experiences. I empathize, but that feels so meaningless considering the hardship they have faced. I want to help these people, and they’re just a fraction of all of the people in Nepal going through this tragedy. There are scores of villages across the region who are even more remote, and also completely flattened. For me, this is where Build Change comes in. Their impact goes beyond the rebuilding 143 homes in this village. Their mission is to scale the rebuilding and retrofitting process across the country. They are demonstrating earthquake-safe building practices and training builders to retrofit. They built model homes that have diagrams even non-Nepali readers (myself included) can have some understanding of. They have completed retrofits and are working with the government to design more affordable new constructions. They are striving to address the unique living conditions of the villages in the reconstruction. There is a lot of work ahead to rebuild these villages in Nepal and Build Change is in the thick of it. They are scoping out how to scale rebuilds and retrofits to the hundreds of thousands of people who need it. It has been an amazing experience to see their impact firsthand. We are now all completely submerged in Nepali time and the first four days have quickly slipped by providing in a huge mix of emotions. I completely echo the words of Christine and Matt on how much of a culture shock it was arriving in Kathmandu four days ago, but what once seemed so strange to us all now feels like the normal way of life. As Christine mentioned in her blog, the five of us parted company yesterday, with Matt B. and I heading to Dhunkarka whilst Christine, Meghan, and Matt N. went to Sindupalchowk. After 3 hours of travelling (that felt more like riding an elephant than being in a jeep) we arrived at Build Change’s current retrofit houses in the region and were greeted by Kiran and Manoj, the respective site managers. At 25 and 27 they both have solid heads on their shoulders and are each leading a team of 6 workers from the village.The workers all want to learn how to retrofit these buildings so they can provide safer homes to more families in the community and it was very heartwarming to hear the pride they have in working for Build Change. 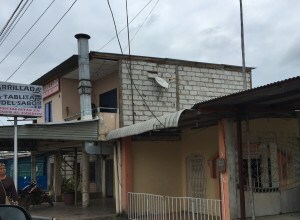 These houses were chosen for retrofitting by the local village council due to both the damage level sustained, enough to require retrofit but not enough for rebuilding, and the financial position for the family. 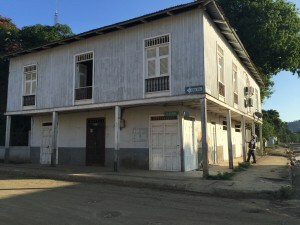 They are typical buildings of the area consisting of 3 floors with approx 120m2 of floor area – the first for living, the second sleeping, and third for storage of crops. The retrofit includes a number of structural alterations, including new columns and beams to tie the walls and floors together – these can be either wood or concrete, through stones connecting the inner and outer leaves of the wall to ensure they do not separate in an earthquake, horizontal bracing within the floor to restrain the walls further and a ring beam at the top of the house to hold the walls together. The build time for these houses is 8 to 12 weeks, which is unbelievably fast given everything that they have to get done and means a lot of hours spent on site, even requiring them to work every weekend! Seeing these buildings has allowed us to identify a number of small projects where we may be able to help Build Change streamline their designs. These incorporate a number of structural alterations to maintain the high standard of retrofitting whilst reducing the amount of material used and thereby the cost. We intend to work on these further both during our time here in Nepal and when we return to RMS. Now for the more social side of our time in Dhunkarka! We have met some truly wonderful people and have been amazed by the hospitality of everyone here. So often we have wandered into a local villager’s house to be met by smiles and the offering of food and tea… Back at home we would be phoning the police before they even crossed the threshold! The two Build Change site engineers have been brilliant in helping us explore the place, introducing us to the locals and initiating us in their local Nepali cuisine. Enjoying a beer and Mo Mo’s (a Nepalese food similar to a gyoza) with them in a tiny bar whilst swapping stories about our hobbies, Build Change and the earthquake, was a moment in time I will never forget. Since arriving in Nepal my overall feeling is of surprise by the slow recovery process that has happened since the earthquake. However, with organisations like Build Change and the Nepali people joining forces, it feels like there is real progress being made. Given time, who knows what can be achieved – especially if you listen to Noll! I know that I speak for all the Trekkers in saying that we hope being here can help them along that journey. Nothing could have prepared me for the initial culture shock that set in while touring the streets of Kathmandu on our first day in Nepal. It may have been because I just finished a 24+ hour trip to the other side of the world and had nothing more than a few hours of airplane sleep, but I was extremely overstimulated. Walking (and driving) in Manhattan is a breeze compared to Kathmandu. To put things into perspective, imagine a narrow roadway that looks like it was designed to be a one way (partially paved) road. Now, imagine that same road being used as a two lane street, full of cars, buses, and motorcycles and all the vehicles moving, turning, and stopping wherever and whenever they want. There are no stop signs or stop lights. Now, fill this same road with people. This is what driving/walking in Kathmandu is like. Cars pass each other whenever they want, most times playing chicken with oncoming traffic. In areas with sharp turns, vehicles honk their horn around every corner to alert oncoming traffic of their existence. However, even amid all this chaos, no one is yelling. No one is angry. Everyone is patient. It is unlike anything I have ever witnessed. The people of Nepal have such an appreciation for everything around them. We had dinner with many of the people from Build Change on Monday night, which was a great opportunity to chat with them about everyday life in Nepal. There was one story that really stuck with me. 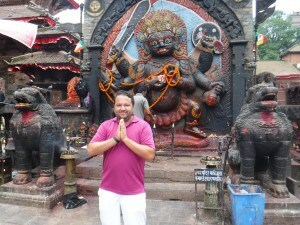 I mentioned to one woman that I was surprised at how calm everyone is, especially in Kathmandu where it is so crowded. She instantly asked me about my meditation habits. I gave her a slightly embarrassed look as I admitted that I do not meditate. She then proceeded to tell me that mediation is very common in Nepal and it gives people full control of their own minds. She personally went on a 12-day meditation journey where she could not speak for 12 days and only had one meal per day. Each day, she woke up at 4 AM to begin her 2 hours on, 1 hour off meditation sequence. The first 3 days she spent focusing on breathing. The remainder of the time was spent focusing on senses. She explained how difficult the journey was but how much it taught her about herself and her mind. She did admit that she cried during the first 3 days and wanted to give up, but she stuck with it. There was so much passion in her voice as she described her journey. She believes that everyone should experience that journey at some point in their lives and challenged me to begin meditating, even if I started with 5 minutes per day. After getting to know the people at Build Change, it was time to go into the field. Today (Tuesday) was our first day on site at the Build Change field locations. We were given a choice between two locations: Dhunkharka or Sindupalchowk. Matt Nielsen, Megan Arnold and I decided to go to Sindupalchowk. Matt Bussman and Alastair Norris chose Dhunkharka. Each location is approximately 2.5 hours from Kathmandu. Mansi from Build Change is joining us while we are in Sindupalchowk. Sindupalchowk is naturally beautiful. It is surrounded by rolling hills, rivers, and lots of greenery. Driving through the winding roads, it is easy to get lost in the beauty that surrounds you. Unfortunately, Sindupalchowk was one of the worst-affected districts as a result of the April 2015 earthquake. Many homes and schools were completely flattened. It is devastating. As we drove into town, we noticed a long line of people outside a building that overlooked a river. We came to find out that was a line of people asking for aid to repair/replace their damaged homes, even over a year after the earthquake. When we arrived at the Build Change field office in Sindupalchowk, there were two Nepali men waiting inside. They were there to design their homes with Build Change, as they unfortunately lost theirs in the earthquake. We had a chance to interview them on camera (with Mansi from Build Change as our translator), which we hope to share with everyone after the trek. After the interview, Mansi told us how excited the men were to be interviewed by us and kept telling her they “were there are the right time”. Even though they were discussing something so heartbreaking as rebuilding their destroyed homes, they were so pleasant and positive. This is a common characteristic of the Nepali people. We also had a chance to see a school that Build Change recently rebuilt. 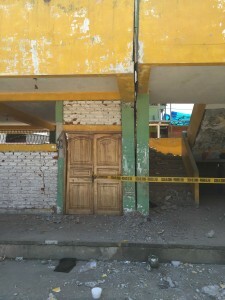 Everything but the roof of the school collapsed during the earthquake. 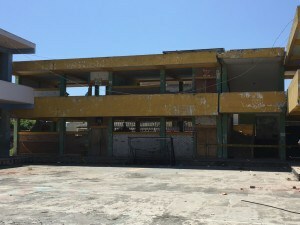 At the same site is a second school with the same damage that they are planning to rebuild. While there, we met additional people from Build Change, as well as people Build Change is collaborating with from World Vision. We had a great round table discussion with the whole group while sitting inside the school. We learned that the Nepal building codes were adopted from India, which were adopted from the British. 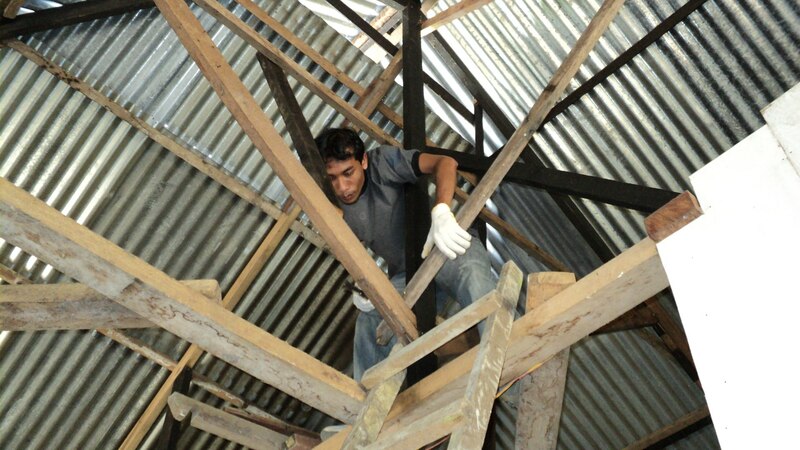 Because of this, a roof built to code needs to be designed to sustain 47 m/s wind speeds in Nepal. This makes new roofing extremely expensive. As part of my project with Build Change, they have asked me to help lead them in the right direction to prove that 47 m/s is too high for Nepal. If we could do this, this would help them reduce cost in building new roofs, making it more affordable for more people. We ended the day at the field house, where we were served a delicious meal prepared by one of the caretakers of the field house, who they call “Didi”. Naturally, I can’t write a blog post without commenting on the food. I have been quite impressed by the Nepali cuisine. It is delicious! The most common meal is a Nepali set. It is essentially a large gold plate with rice in the center, surrounded by smaller portions of vegetables and curries. It is always served with dal (almost like a lentil soup), which you mix with the rice. A full set ends with yogurt, which I’ve been told helps with digestion. We have eaten this for most meals since we’ve been here, with each place having slightly different variations of the dal and side dishes. The drinks are even more amazing, especially the tea. There are many variations of tea to choose from, my favorite being the iced ginger lemon tea and the hot masala chai. I have yet to discover any chocolate, but will be sure to report back when I do! Overall, my experience in Nepal so far has been wonderful. The people at Build Change have been so warm and welcoming. They are a wonderful group of people with a real passion for their work. They are so kind and are making us feel right at home. I am extremely grateful for this opportunity and am very thankful to be sharing this adventure with this group of the trekkers. Even though the five of us have only been here for 3 days, I already feel like I’ve known them forever. I cannot wait to see what adventures the next few days bring! Nepal. The mere mention of the word conjures images of the lofty, snow-covered Himalayas and towering Mount Everest. Here in Kathmandu, the world of the Sherpa feels as far away from me as everything else that is familiar and known. Now half a world away from home, I find I’m rediscovering my inherent and natural senses. New smells, strange tastes, constant sounds, bright colors, and the feel of the humid air on my skin all feel new, and overwhelm my mind. Traffic, consisting of a whirled mixture of cars, scooters, bicycles, and daring pedestrians, moves chaotically through the winding snake-like streets without order. Horns constantly sound and travelers boldly veer into traffic, often not leaving more than a hair’s length between them and others venturing down this concrete river. Sidewalks seem not to exist, leaving foot traffic exposed to the frenzied motorcade. Lifeline wires dangle precariously from building to building like synthetic vines creeping through an urban jungle. Rainwater from the monsoon washes down streets and creates murky lakes along the avenues that seems as if it would swallow a motorbike whole if it got too close. The sky, broken with clouds, gives a mixture of greys, blacks, and the occasional blue. Low clouds hug the surrounding mountains like soft blankets, obscuring our views of the loftiest peaks. As our guide slithers us through the narrow and winding pathways of Kathmandu, we catch glimpses of fallen masonry walls, heaped in red brick piles. We see bamboo scaffolds covering shaken structures, attempting to salvage the heritage at the heart of Kathmandu’s Durbar Square. Wooden beams push up tired walls, letting these weathered buildings breathe a last breath. While the earthquake that took so many lives and leveled entire villages happened over a year and a half prior, rebuilding and recovery in many ways resembled the immediate aftermath. Response efforts are not the coordinated and fast-moving endeavors we’ve come to expect in the West. A country lacking highly-organized infrastructure, such as Nepal, has no plan for these disasters. 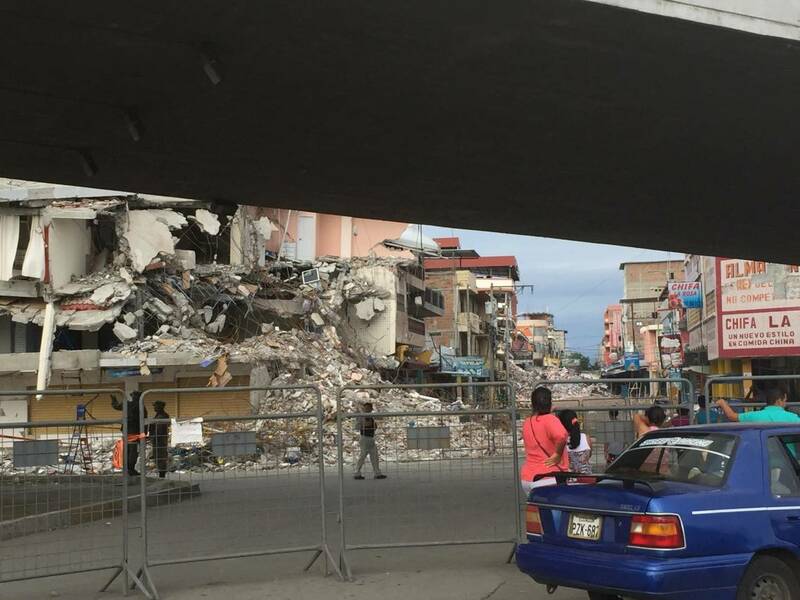 When the earthquake comes, the rubble is piled, people move homes, and life goes on. Insurance coverage for homes is a foreign concept here, and aid from NGOs and the government is the only solution they know. Even that money doesn’t always trickle down to the common homeowner, and citizens are left to fend for themselves in many cases. We hear stories of people sleeping outside for weeks and months after the quake, while houses are torn down and new ones are built. Retrofitting is also a foreign concept, but one that could have great impact on those living in more rural areas and without the means to rebuild. That’s the story we are here to uncover. How does rebuilding and rebirth of these communities happen? What can be done to improve the process and relieve unnecessary suffering and death? How can outreach efforts like these be used on a more massive and grand scale? How can people like me, who before this week never set foot within 7,000 miles of a place like this, find ways to lessen the impact of catastrophes in areas like this? As we moved our weary and jet-lagged bodies from our hotel to the Build Change office in Kathmandu on Monday, our mission here began coming in to slightly better focus. 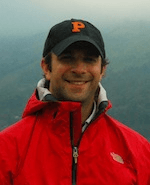 We met with Noll, our personal guru for this trek, and offered up our diverse expertise. Hours passed as we shared our backgrounds and devised a plan of action. We spent the afternoon interviewing the local Nepalese staff on their experiences working with Build Change, also delving in to how the earthquake affected them on a personal level. Some spoke of hardships, protecting families, living outside for months at a time, and rebuilding. For others, the pain was so sharp and near, that they were understandably unwilling to relive those terrible moments. I’ve come to find in Nepal, hardship does not overcome life. Our dinner with 15 of the local Build Change staff was a testament to that fact. Mugs were filled with Tuborg and Everest beer, while small cymbal-shaped goblets beheld a Nepalese liquor I was too tepid to question. Music reverberated from the centuries-old wooden timbers and dancers swirled around between ankle-high tables. As we sat cross-legged on the floor, in the old traditional style of Nepal, we shared stories, had a few laughs, and celebrated recent accomplishments. The night eventually wound up, and we all parted ways, making new friends and recounting the fun times had throughout the evening. Good food, good beer, and good company. Perhaps this foreign land that seemed so shocking mere hours earlier had now shown itself to be familiar after-all. On May 3rd, we went with Gen. Ruiz and Ing. 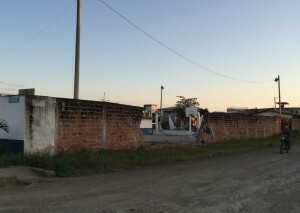 Flores into the barricaded area of Manta, the neighborhood of Tarqui. This area had the most damage and was a mix of large to small commercial buildings and hotels, plus multi family and single family houses (some mixed use). Many of the small and medium sized buildings that had collapsed were already demolished and some were being taken down while we were there. There were buildings with very different performance on the same block and the reason for the difference in performance was not obvious. Additional investigation is needed to see really why some had collapsed and others did not. There were several green-tagged residential buildings in the area – particularly along one street. Though one of the homeowners there was telling us that they didn’t know if the green tag for their house was correct because although the exterior looked undamaged, they said many of the walls inside were damaged. 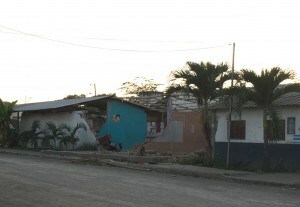 Green-tagged houses in Tarqui, Manta. Tuesday evening we presented a seminar with Ing. Flores in Manta, open to the public. We spoke about our experiences in housing reconstruction following other earthquakes and Ing. 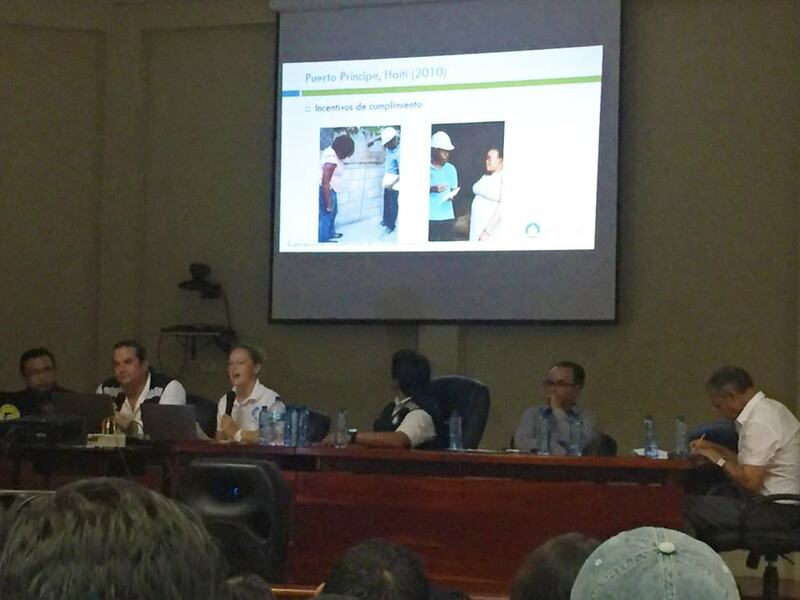 Flores presented on the Construction Code. 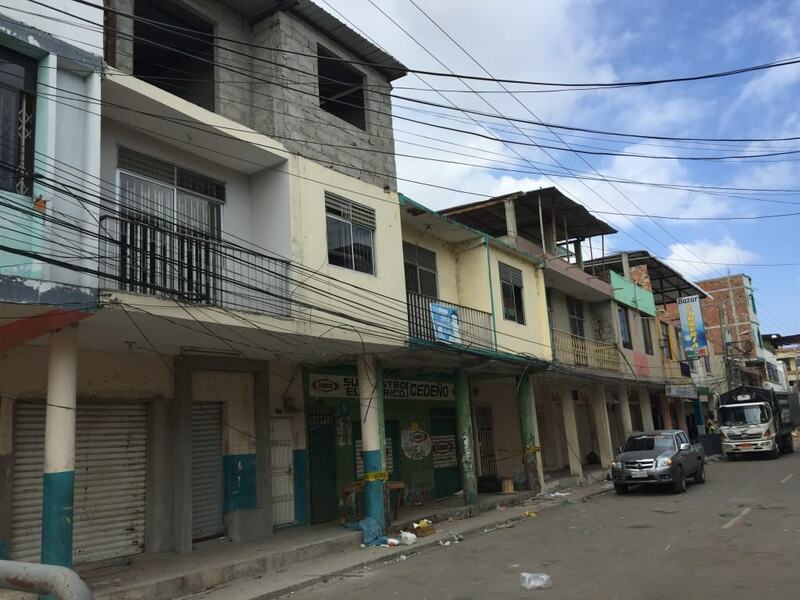 On Wednesday we headed to Portoviejo and stopped in Crucita, a coastal town along the way. Overall Crucita had very little damage compared to Manta to the south and Canoa to the north. A local business owner told us that only 6 houses had significant damage. Walter interviewed a builder there to find out about local construction practices. 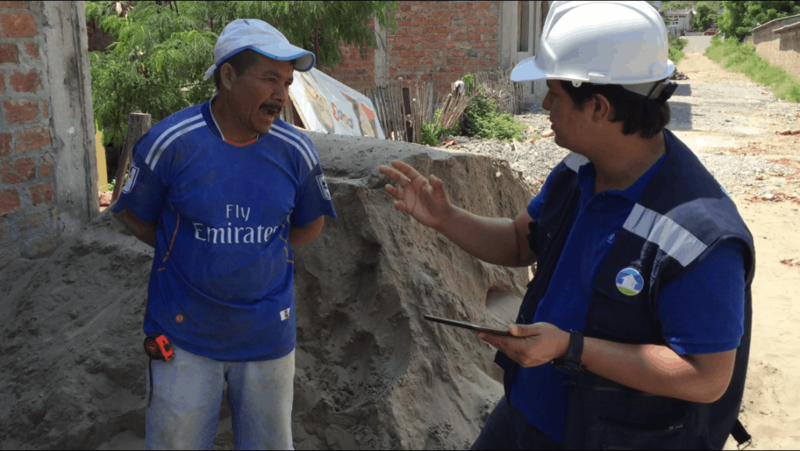 Walter interviewing a local builder, Oriol, in Crucita. 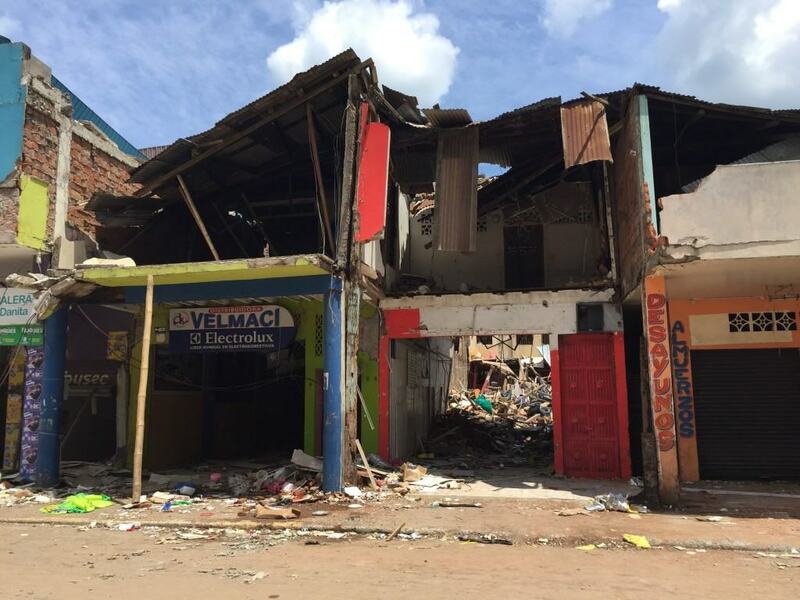 We then visited downtown Portoviejo, the area in the city with the most damages. There were not many 1-2 story houses, but some were damaged, particularly when mixed-use. There were many taller, larger and mixed-use structures, which were damaged in many cases. 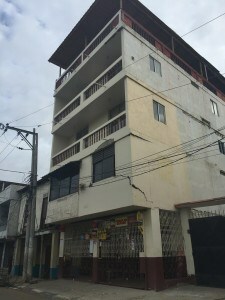 Damaged 4-story mixed use buildings in Portoviejo. We then presented a similar seminar as the previous night with Ing. Flores, but in Portoviejo. After Canoa, we next headed north to Jama, another coastal town. In Jama we selected a street in town and compared the building type and performance of each, one-by-one. There were 7 houses, some with commercial space below. Six houses were wood framed, 2-stories, and one was reinforced concrete, 3-stories. Of the wood framed, 5 had masonry infill at the ground floor and 1 had bamboo lath with plaster overlay at the ground floor. Four had wood only walls at the upper level while two had mixed wood and masonry infill walls at the upper level. 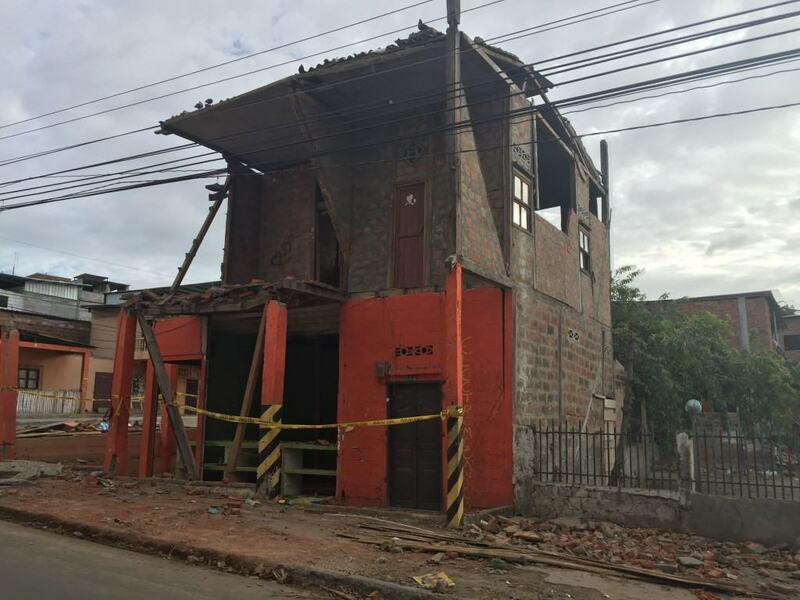 In general of the wood-framed buildings, we saw the most damage (wall and partial roof collapse) in the upper levels of buildings where wood and masonry infill walls were mixed. This is probably because the wood walls were not sufficient to resist the larger load imparted by the adjacent heavier masonry infill. Houses with wood only walls at the upper level generally performed well, with minimal damage (some movement at the floor level at some column joints) except where it appeared the wood was deteriorated and not well maintained. 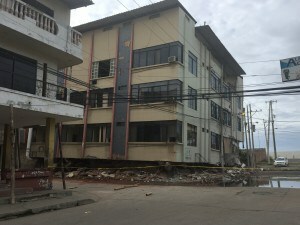 The concrete frame with infill building fully collapsed at the ground floor level (hinging at the ground floor columns) and the infill was damaged. It was not directly observable, but it was likely that the ground floor had more open area in the from elevation, creating a weak/soft story condition. In Jama, we also observed some damages to schools – site wall collapse and building wall collapse. 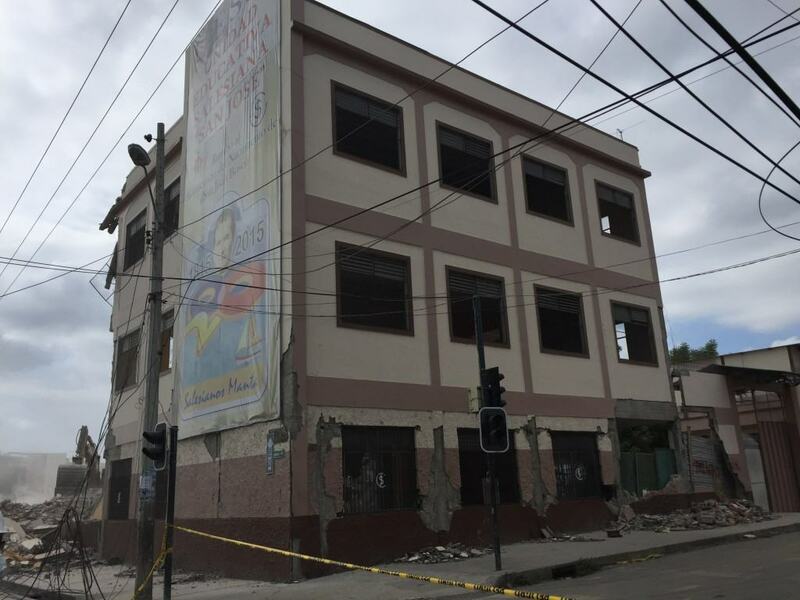 In general it seems people have a more negative impression of the concrete buildings and are more comfortable with wood after the earthquake, because of the difference in performance and survivability. 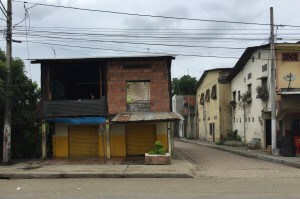 We saw a comparative example on the ride back to Manta, when a 2-story concrete frame with infill police station was heavily damaged, and the adjacent wood housing across the street was fully usable, without damage. This morning we met with Ing. 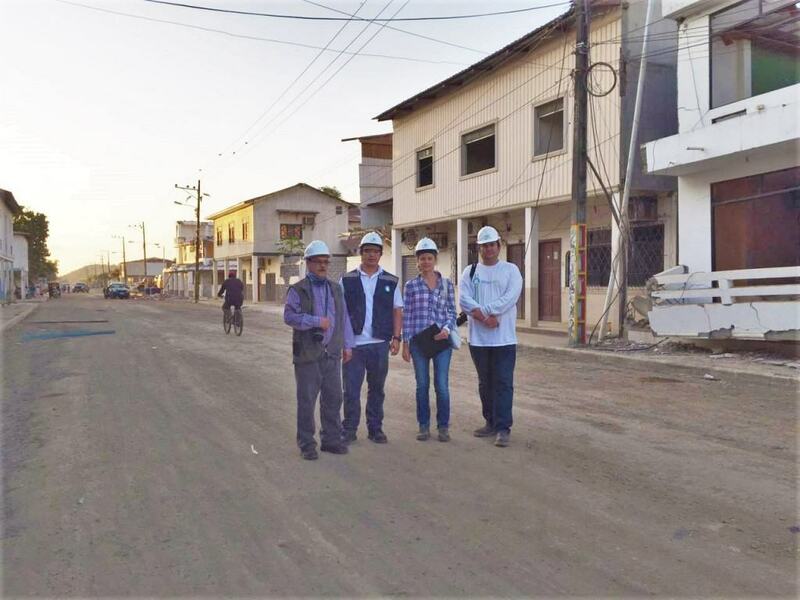 Hermel Flores, owner of Hermel Flores Construcciones and former chair of the Ecuatorian Chamber of Construction, and General Florencio Ruiz Prado, Director of Citizen Security for Manta, in Manta. 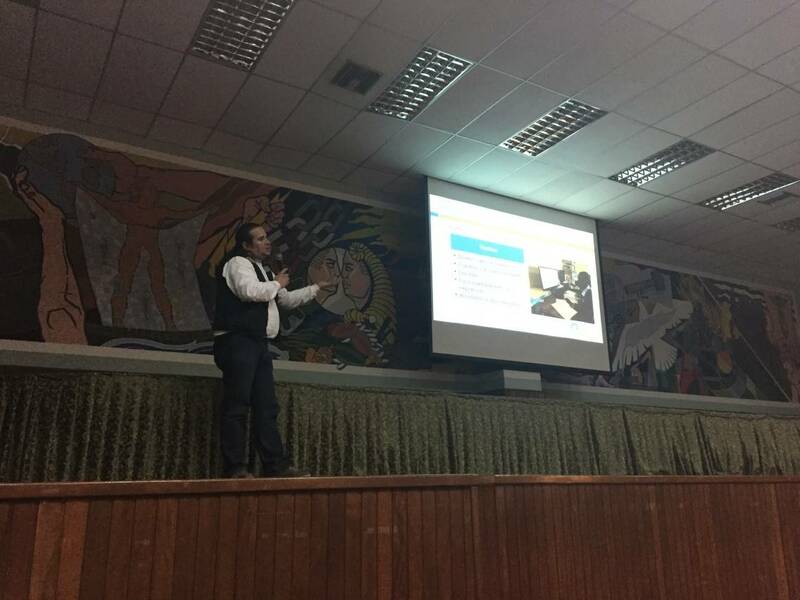 We discussed our activities, the situation and the presentation they coordinated for us to give on Tuesday and Wednesday, in Manta and Portoviejo, respectively. Ing. Flores traveled with us next up north towards the epicenter. The coast of Ecuador is in the highest seismic zone of the country. There are RENAC sensors located up and down the coast which recoded the accelerations in the recent earthquake. The records from these sensors are being retrieved and processed. We’re looking forward to the report on those coming available soon to see how they compare with what we observed along the way. 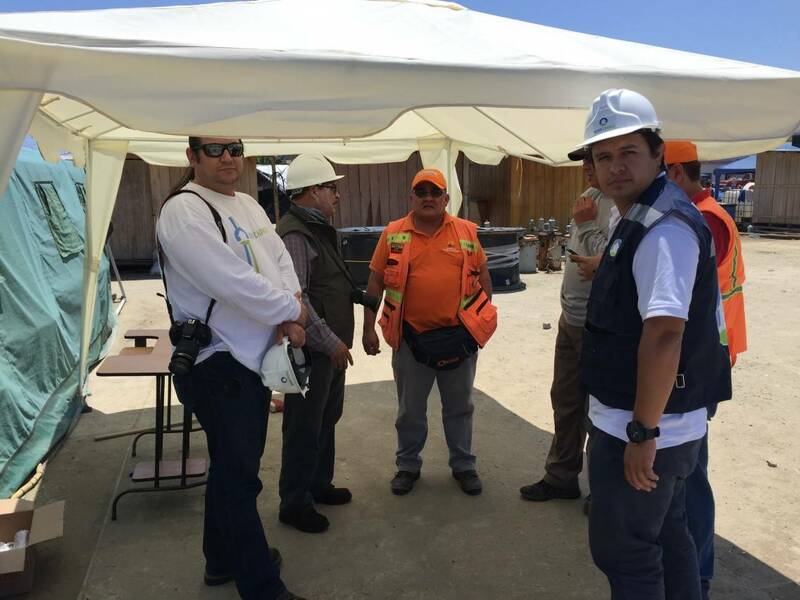 We stopped in Canoa and checked in with the COE, the emergency operations committee. 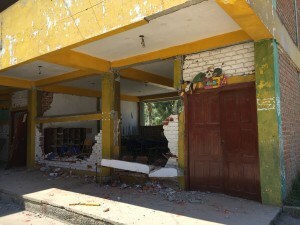 They reported that 9 of 17 rural schools in the area collapsed or had significant damage and that both of the two urban schools were damaged and not useable. 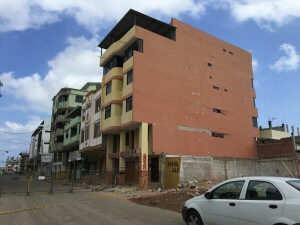 Many of the collapsed buildings in town had been hotels, rather than houses, but houses were also significantly damaged. We visited one of the schools in town, William Fletcher, with the municipal engineers. 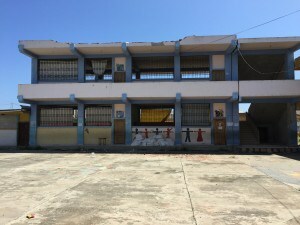 It had three different two-story classroom buildings, all were reinforced concrete frame with infill. There were also two seismically separate stair towers, with minimal damage. 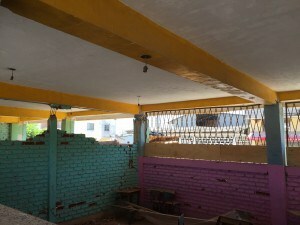 One of the classroom structures, blue and white, had minimal damage and could likely be easily repaired and retrofit. (Although, one of the damages was parapet collapse, which could be highly hazardous to students below.) The other two buildings were more heavily damaged, and one of them had noticeable residual drift. 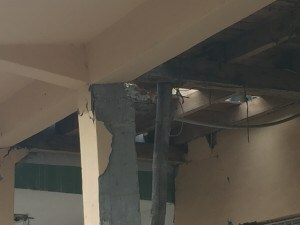 The damages included failure of the ground floor columns at the base and at the top below the floor beam, failure and cracking of the masonry infill, and failure at the intermediate beam connection to the column. You could see that the frame columns were smaller in the more heavily damaged buildings (green and yellow), and the infill was not covered in cement plaster as it was in the blue and white building. These differences may have contributed to the difference in performance. Many houses in the town were constructed of timber framing with masonry infill. Another common housing type was concrete frame with infill. We saw examples of damage in both and Walter interviewed several homeowners. In one case, the house was timber framed with brick infill. 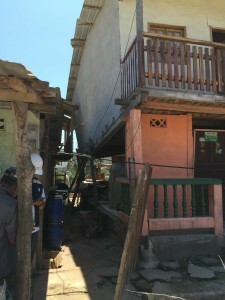 During the earthquake, the masonry failed at one side of the ground floor, the wall collapsed and the corner post became disconnected from the floor, causing the rear corner of the house to partially collapse. The homeowner wants to rebuild his house in the same way, but with one exception – he would not use brick infill, but all wood walls instead. He thought that would be less hazardous in another earthquake. May 1st was our first full day in Ecuador, after landing in Guayaquil on April 30. Our team has three members: Traveling from our Bogota office there is Juan Caballero, architect and Director of Programs and Partnerships for Latin American, and Walter Cano, structural engineer and Project Engineer for Colombia. 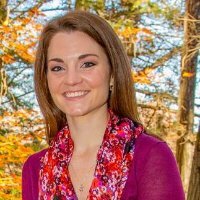 From the U.S./headquarters there is Lizzie Blaisdell, structural engineer and Director of Engineering. 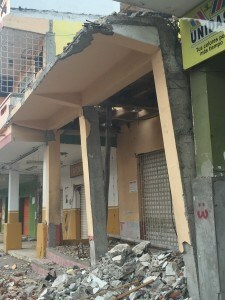 In Guayaquil, we saw little evidence of an earthquake. 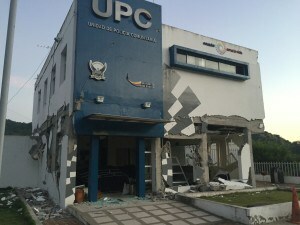 According to the preliminary report on the Instituto Geofisico website (http://www.igepn.edu.ec/) a strong motion sensor near Guayaquil, “AGYE” experienced a maximum ground acceleration of 23.04 cm/s2 (approx. 2%g) while another just east of the area, “AMIL” recorded a maximum acceleration of 51.04 cm/s2 (approx. 5%g). 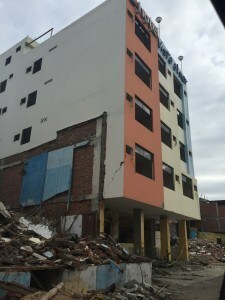 As a point of comparison, the new Norma Ecuatoriana de la Construccion (Ecuadorian Construction Code) considers the seismic zone factor, Z, to be 0.4. For a Type D soil, that would result in a peak ground acceleration of 0.48g for the design spectrum (475 year return period earthquake). So the recorded motions indicate the accelerations were about 5-10% of the design basis earthquake for Guayaquil, fairly low. We spent the day driving toward Manta. 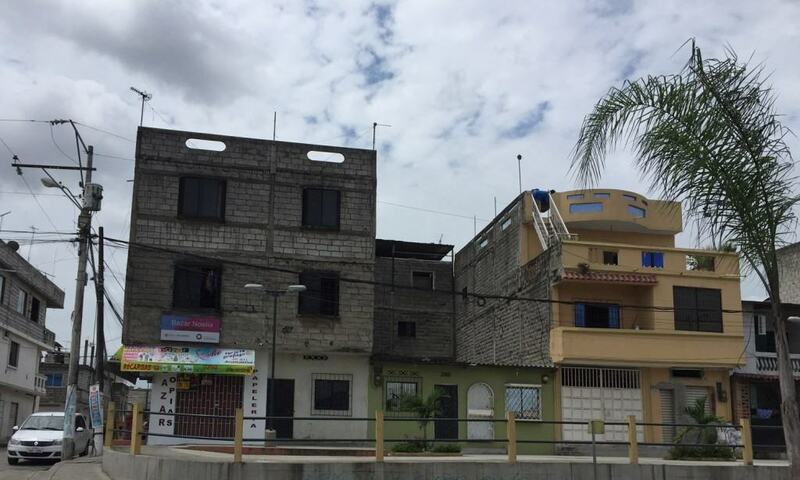 In Guayaquil, the housing was generally taller than once we were out of the city. The residential buildings were typically concrete frame with block infill, or confined masonry in some cases. As we drove further from the city along highway 482, the housing types became more variant. Instead of columns and beams built from reinforced concrete construction, we also began to see houses that were heavy timber frame or even steel frame, with infill. The infill varied too, from concrete blocks, solid bricks (often turned vertical on their narrow edge), or hollow clay tile. 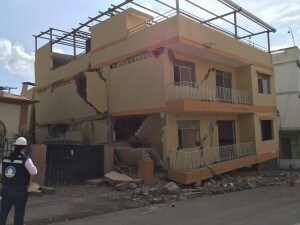 We only started to see significant signs of earthquake damage as we approached Montecristi, a town just east of Manta. 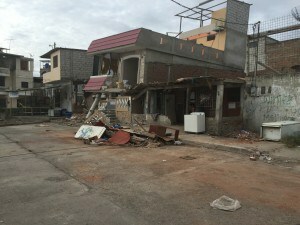 However, once we arrived in Manta, the damage was evident and areas of the city were barricaded for safety. We saw similar housing types in Manta as we had seen on the drive. Several timber frame with infill houses were heavily damaged. 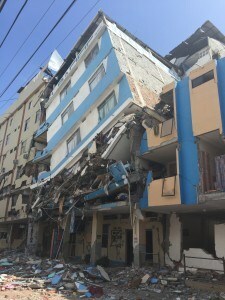 Probably the masonry did not have good connections with the frame and it was also not strong enough to resist the earthquake – causing failure of the masonry and separation from the frame. Sometimes it appeared that the collapsing masonry tore down other parts of the building with it, such as the roof or floor. Separation between the different parts of the building due to poor connections between elements was a common type of damage observed. 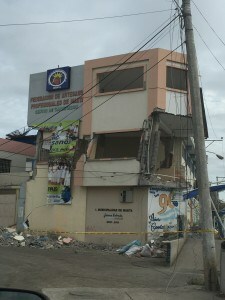 The connections were not strong enough to keep the building tied together in the earthquake. Several residential buildings suffered from soft/weak story failure. We also saw failure or damaged front walls where they cantilever out over the facade below. The vertical discontinuity this causes can create stress concentrations at the overhang and increase flexibility at the base of the overhanging wall – leading to cracking. We see very similar types of buildings to these from Manta everywhere around the world where Build Change works. It’s always hard to see communities suffering from these disasters. We hope these vibrant towns will be able to recover from this disaster quickly, while rebuilding safer, more resilient communities. Follow our team in Ecuador. Click here for link to Autodesk Foundation video. In Colombia, we are working with city governments, the private sector, and homeowners to repair and strengthen homes before the next earthquake strikes. Retrofitting saves lives by ensuring that houses will protect families and children from future natural disasters. 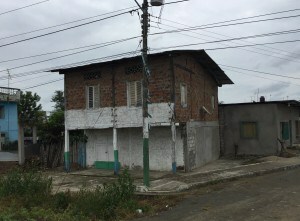 We started out retrofitting a single house in Bogotá, Colombia, to provide an opportunity for local training and to demonstrate feasibility. Jorge Prada’s family now lives in a safe house and he will help retrofit others. 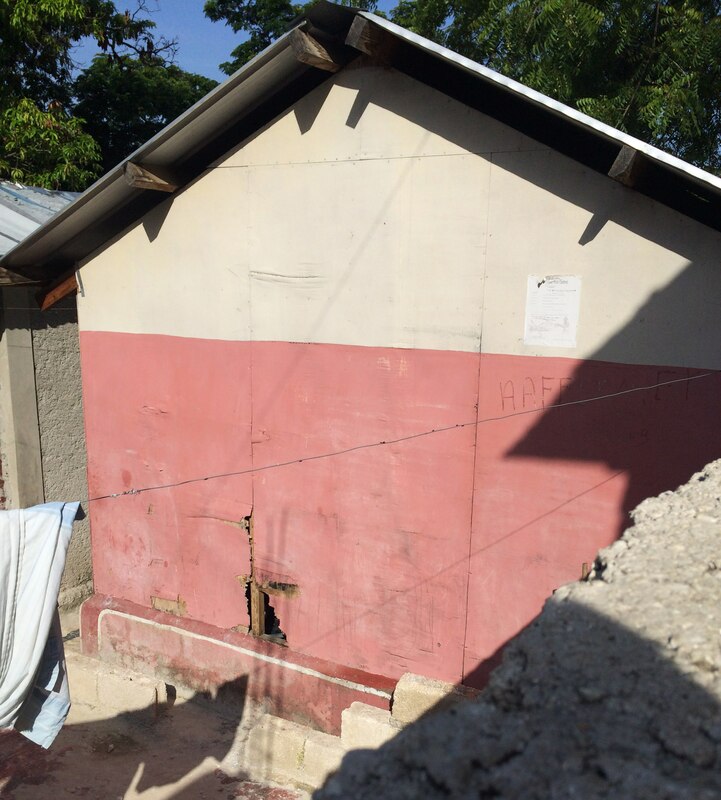 In partnership with Caja de la Vivienda Popular (CVP), the Swiss Re Foundation, and RMS, Build Change is now launching a pilot retrofitting project that will reach 50 houses. We are currently training CVP staff and contractors in retrofitting, to build permanent local skills. Then, the retrofits will begin and our staff will support those projects with technical assistance in design and supervision of construction. We look forward to making at least 50 families safe in the next few months, and many more in 2016. Thank you to all our partners in Colombia, including the Autodesk Foundation and Micro-Documentaries for creating the video above. A second strong earthquake struck Nepal on May 12, 2015. We are relieved to report that our team reported in and they are unharmed. The families in the small village they were in when it struck are also unharmed. “We are all fine. At the time of the first M7.3 earthquake near noon, we were in a very remote village, Thulo Guan, Balthali, an hours’ drive from Kathmandu on a rutted, narrow dirt road along a cliffside. No one was hurt in this village. We were standing on the 2nd floor of a relatively undamaged house (newer construction from about 2008) talking to the owner when the quake hit. I have never seen people fly down steps so fast once what was happening sunk in! I actually saw the (minor) out-of-plane movement of the stone and mud mortar wall (about 15″ wide) when I got outside. 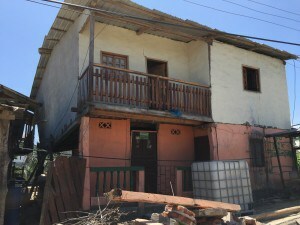 I’m happy to say that house is still fine and habitable after the earthquake and the aftershock. We were still there a short time later when the M6.3 aftershock hit. 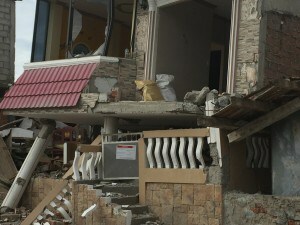 A couple of already severely damaged houses collapsed further. 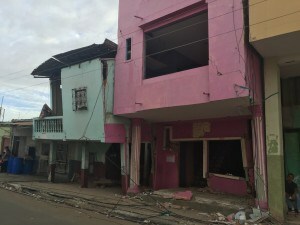 The relatively undamaged houses remained intact. Our thoughts are with the families in other areas who lost loved ones to this second earthquake. 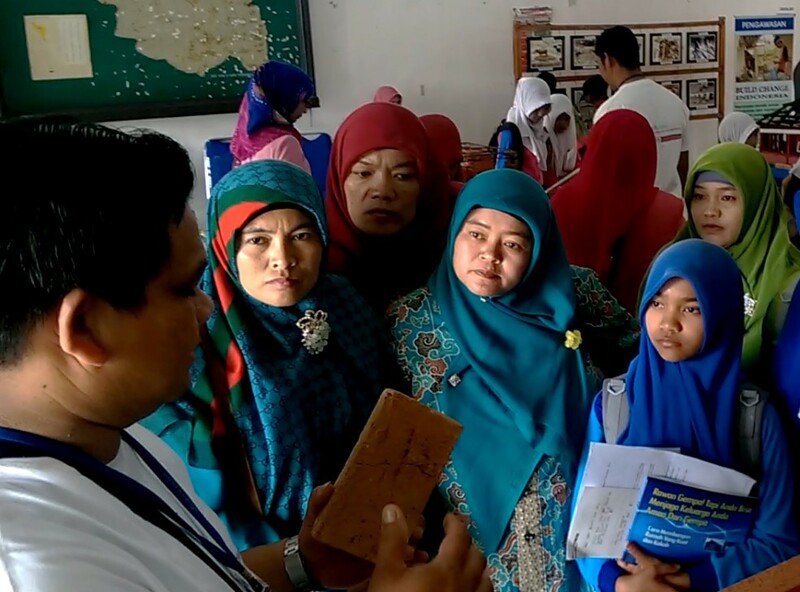 Over 150 adults and 100 children participated in our Better Building Material community event in Takengon, Indonesia in December 2014. We have been working with 200 local brick-makers, mostly women, to help them produce better quality bricks. 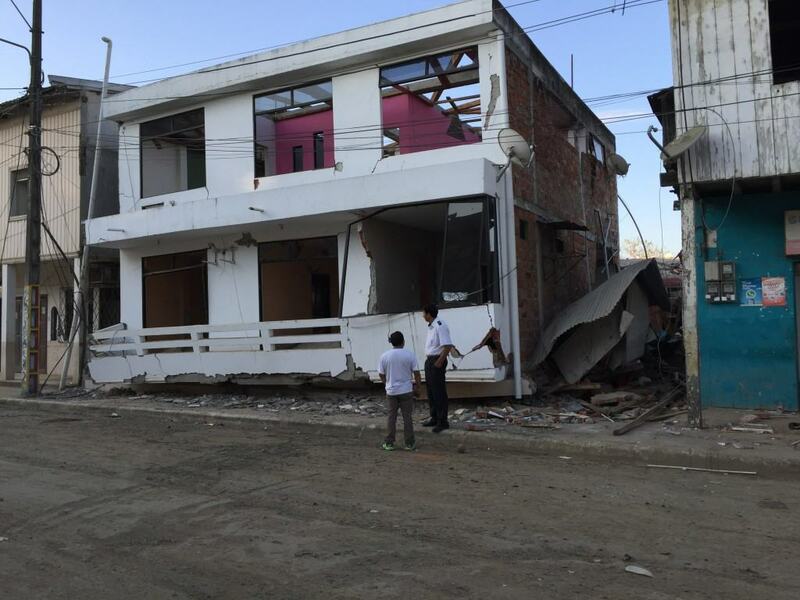 Houses and schools built with poor-quality bricks or concrete blocks are likely to collapse during natural disasters. 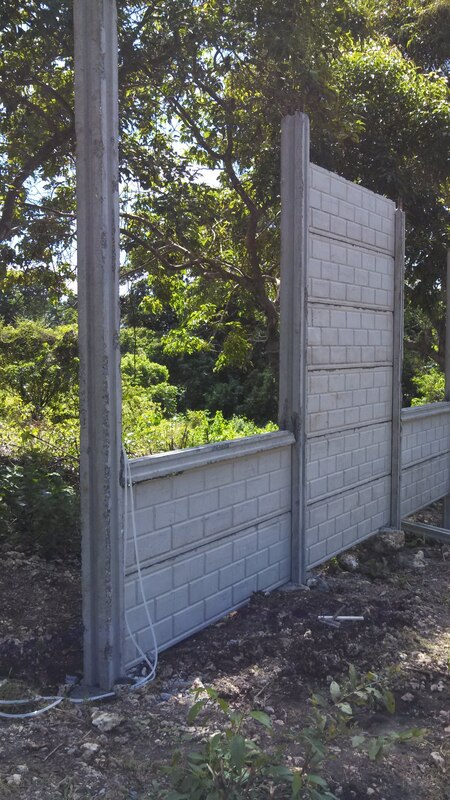 Better bricks and concrete blocks make safer houses and schools. We provide on-the-job training for small businesses that manufacture bricks and blocks to improve the quality of their products. We also offer business skills training in management, budgeting, and more efficient manufacturing techniques. We conduct public outreach to encourage local communities to use these safer building materials. To keep children occupied while their parents learned about safe building techniques and better brickmaking at this event, we held coloring, drawing, and writing contests. “I want to advise other young women like me to not choose only nursing, accounting, or secretarial work. Dare yourself to learn other trades,” Widleine George says. She stands outside in her construction training station, where she demonstrates proper techniques to trainees and oversees the masons’ progress. “I receive a lot of respect because of my position, because it’s not typically a woman’s job,” she says. Widleine comes from Carrefour-Feuilles, one of the areas of Port-au-Prince that was severely damaged by the earthquake in 2010. She started her masonry career as an apprentice, in an intensive six week training program run by Build Change in partnership with Centre d’Etude et de Coopération Internationale (CECI). After passing the exam at the end of her apprentice training, she began working as an intern under masons building in Carrefour-Feuilles. After this intern period of on-the-job training, she enrolled in our builder training program to become certified in safer building techniques. Very quickly, she managed her own team of construction workers. It wasn’t long before we asked her to lead the training program in which she had once been a student. After her contract with Build Change is over, she will go to school full time. 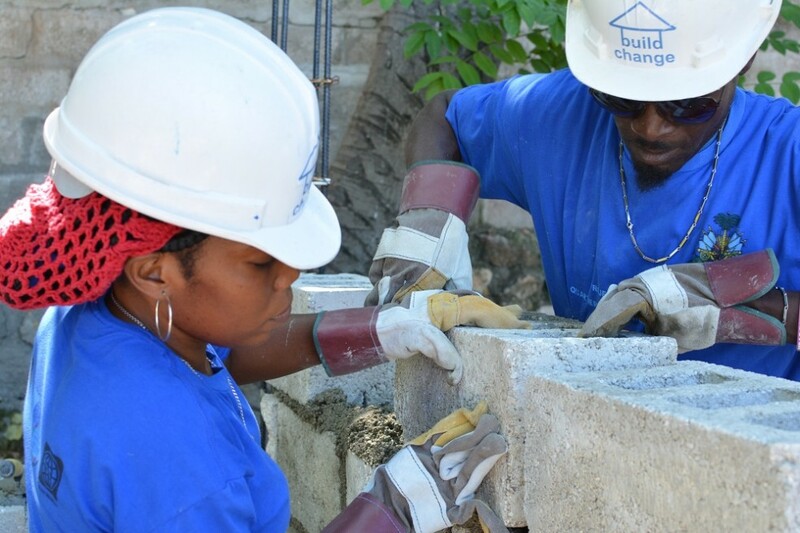 From masonry intern to certified builder to instructor, Widleine is on a path to become a civil engineer. We are inspired by this Verizon video, described in the Huffington Post. “A new Verizon commercial cites a sad statistic by the National Science Foundation: 66 percent of 4th grade girls say they like science and math, but only 18 percent of all college engineering majors are female. Why not build from pre-cast components? Straw bales? Used tires? Plastic bottles? Homeowners don’t steal from themselves. Put them in charge of reconstructing their home, and they reuse materials. Often, they contribute their own funds. And their degree of satisfaction is so much higher than if we give them a house that they don’t trust is safe. We’re not asking them to use sweat equity and build the house themselves; in that case, we would miss the opportunity to train local builders who will go on to build many houses, and put money back into the local economy. We’re talking about empowering homeowners to make their own decisions on materials and architecture, and learn the basics of safe construction so they have peace of mind their house is safe. The government of India (in partnership with the World Bank) had it sorted out after the 2001 Bhuj, Gujarat earthquake. Provide a clear and simple guideline, provide cash grants in installments contingent upon following those guidelines, and provide third party technical assistance to coach homeowners and builders through the process. Why has it taken the rest of the donor and aid community so long to catch up? 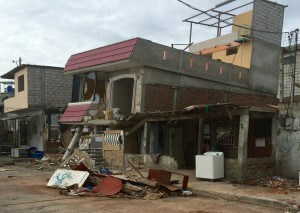 After the Indian Ocean tsunami, the NGO community insisted on donor-driven housing, lured by the perceived need to get houses built quickly and the efficiency of scale. Shortcomings of past donor-driven housing reconstruction programs are chronicled here. 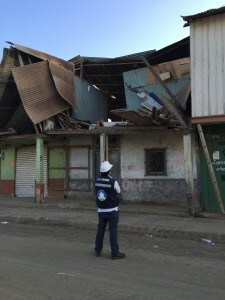 Retrofitting, or strengthening a building to withstand the next earthquake or typhoon, is an efficient and safe way of putting existing stock back in play after a disaster. It can be done at a cost equivalent or lower than temporary shelters. If done in tandem with a large-scale effort to build capacity of local engineers, architects, and construction professionals, it can be done efficiently and at scale. 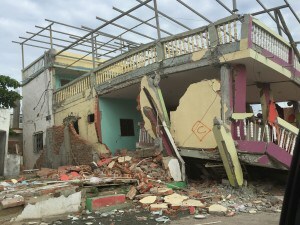 After the 2009 earthquake in West Sumatra, the government of Indonesia strongly discouraged the donor and NGO community from building transitional shelters, or T-shelters. Instead, they recommended providing technical assistance and cash grants. 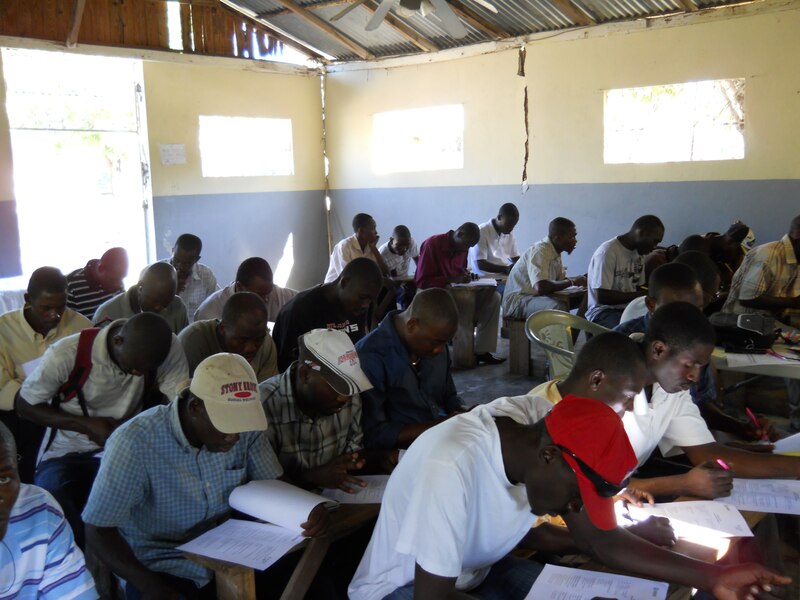 In Haiti, T-shelters were implemented in large numbers after the 2010 earthquake, taking time and resources away from providing a more permanent solution. 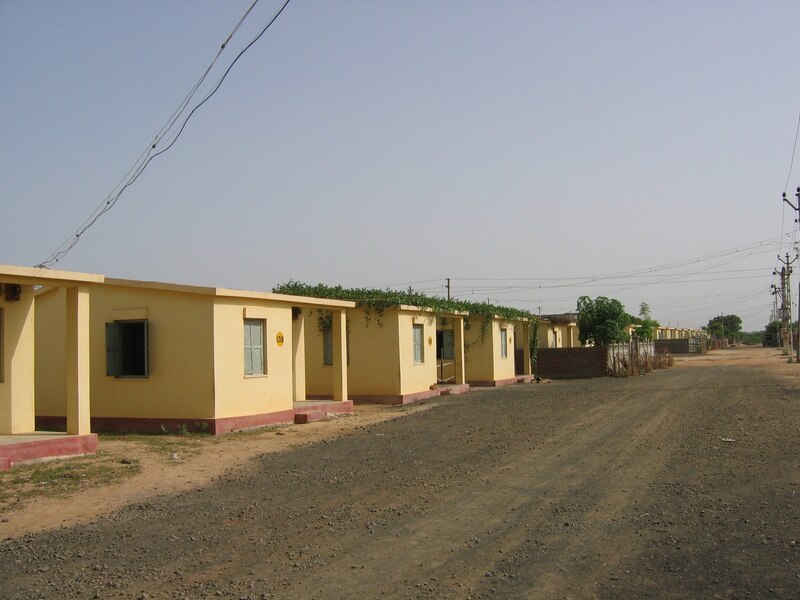 Temporary shelters may be unavoidable in some harsh climates, but most of the world is well positioned to abandon this temporary fix and move directly to permanent housing.